Will Hutchins talks about Will Rogers. Will Rogers. Back in the early ‘30s he commented on the headlines on a weekly NBC radio show—up to the mike ol’ Will would amble, and then he’d ramble, no script, just some notes and whatever came to mind. School teachers cringed at his colorful interpretation of the king’s English. “Shucks,” he responded, “lots of folks that ain’t saying ain’t, ain’t eating.” ‘Twas the height of the depression—Will taught us there is a glimmer of hope and humor during the worst of times. He showed us the light at the end of the tunnel. He never quite got the hang of radio’s time constraints—consequently, the director would set Will’s famous alarm clock smack dab in the middle of the stage. When Will’s time was up and the alarm sounded, he’d meekly sigh, obligingly stop gabbing and promise to be back next week. Will was born William Penn Adair Rogers November 4, 1879, in Indian Territory near present Oologah, OK. Both parents were about one-quarter Cherokee. Will was proud of his heritage, and during his Wild West, circus and vaudeville days he performed under the moniker of The Cherokee Kid. I reckon his great spirituality came from his Cherokee blood. I reckon Will’s the only truly enlightened soul to have ever toiled in the Hollywood dream factory. We all know that human kind is a work in progress. 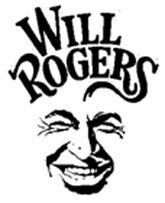 I reckon Will Rogers is the sorta feller God has in mind. No one knows for sure what the origins of the Cherokee Nation are. We do know about the Trail of Tears in the 1830’s when the Cherokee were evicted from their ancestral lands in the southeast and forced to emigrate beyond the Mississippi River to an alien land. I once read there is little correlation between how one does in school and how one does in life. This sure applies to Wild Will. His dad decided Will needed discipline and sent him off to Kemper Military Academy in Boonville, MO. But Will was a rebel, the demerits piled up, and at 18 he borrowed $20 and bought a railroad ticket to Higgins, TX, where he worked as a cowboy on Old Man Ewing’s ranch on the Canadian River. And so one of America’s greatest success stories began. Will Rogers has long been my favorite actor. You might not think of him as an actor. He sure didn’t. John Ford considered Will and Harry Carey to be the best actors he ever worked with. Pretty good tribute, eh? Those three good buddies pioneered naturalism in early talkies. You might say Will was only playing himself. Ay dogies, can you think of anyone more interesting for him to play? I mean, the man was a cowboy—star of stage, screen and rodeo—numero uno at the flickers’ box office—master of rope and yarn spinnin’—horseman and polo player—front page newspaper columnist with 40 million readers (and that’s when our population was 130 million)—after-dinner speaker—emcee at the Oscar show—humorist and comedian—author—champion of air travel—athlete—tap dancer—loud singer—the ‘Mayor’ of Beverly Hills—world traveler and America’s Ambassador of Good Will—pal to presidents and paupers: Sort of a renaissance man par excellence. Do you know of any movie star today who’s had such a rich, full life? If you do, I’ll plunk down a fast eight fifty and go see him or her—I’ll take you with me. Critic James Agee was unhappy with most movie actors back in the ‘40s. He said they seemed to be auditioning for their next roles. Walter Brennan said it’s okay to act. Just don’t get caught at it. I watch most of today’s movie actors, and I’m awed by their talent. Marvelous! Bloody marvelous! How skillfully they show us life’s underbelly. But where’s the humanity? Ol’ Will oozed humanity out of every pore. He operated not out of fear but out of love. He showed us all the possibilities of greatness in this our life. He showed us how much fun it is to be the good guy.